Free from all 14 major allergens. Vegan Society Approved. Free-from means freedom, simple. So everyone is invited to enjoy. Hello to Vegan Society registered recipes free from all 14 major allergens. Yorica is unique. 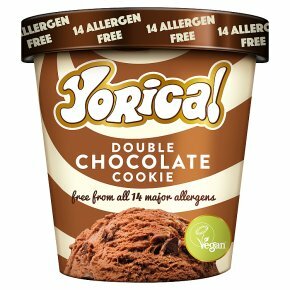 Yorica Double Chocolate Cookie is made with ingredients that do not contain any of the following allergens: Milk, Egg, Gluten, Nuts, Peanuts, Crustaceans, Fish, Molluscs, Lupin, Sulphur Dioxide, Sesame, Mustard, Celery, and Soya. Thanks to our dedicated production unit we are able to offer product free from all 14 major allergens.